I was want­i­ng to find out about the two-fin­ger ges­ture in the pic­ture. It appears to be either the ear­li­est peace sym­bol, and/or rab­bit ears? The “crow foot” peace sym­bol pre­dates Churchill’s V-sign by four or five cen­turies. Its cur­rent form was pop­u­lar­ized by Picas­so in the World Peace Con­fer­ences of the 1950s, when it was alleged to rep­re­sent the Chris­t­ian cross upside down and bro­ken, the sym­bol of a Com­mu­nist peace. Wikipedia has an inter­est­ing dis­cus­sion. 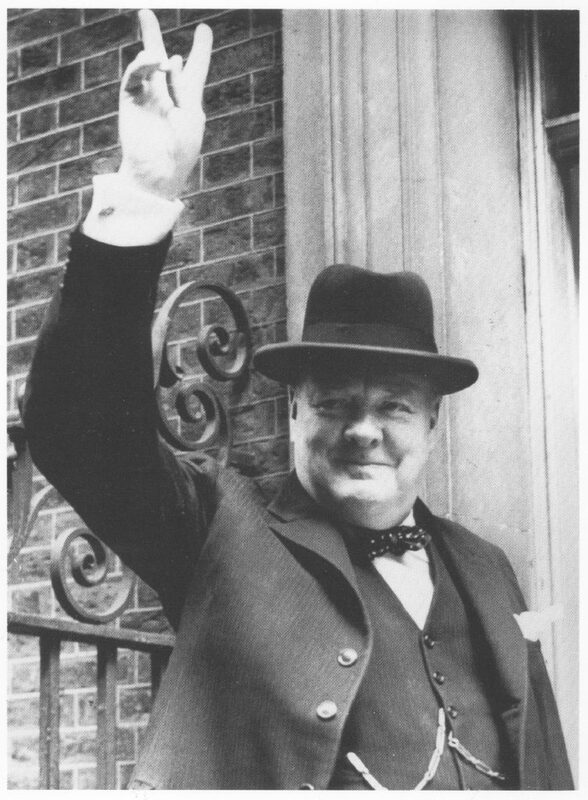 I’m not sure where Churchill picked up his two-fin­ger V-sign (palm fac­ing out), but he cer­tain­ly pop­u­lar­ized it dur­ing World War II.